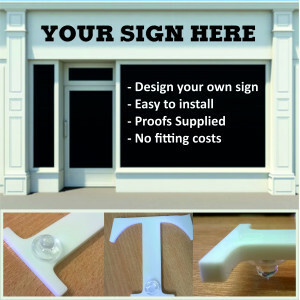 Shop signage letters, complete with stand off locators and template. Made to order coloured acrylic numbers and letters, manufactured from 5mm thick gloss acrylic with laser cut polished edges. Each character comes with locators attached to the reverse of and an easy to install template and guidelines. Helping you to cut out the cost of the fitter. We can do any bespoke sizes, logos etc. and offer a full design service in house. Just message us with your enquiry and we will be happy to assist with your purchase. Unless specified all letters will be supplied as Arial Bold, please add the words you would like in the 'notes' section of your order and we will produce these for you, please ensure all spellings are correct as this cannot be changed once your order is processed. We will only proof your sign before production if requested or if there are any complications with the design. Laser cut 5mm gloss acrylic custom made to order, If you would like any of the letters as lower case to suit, just pop a message in the notes section or email us directly.